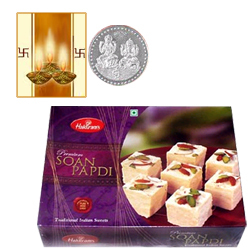 Haldiram's�Soan Papdi with Silver Plated Coin with free Message card. Gross Weight of Soan Papdi is 250 Gms. Haldiram's�Soan Papdi with Silver Plated Coin with free Message card. Gross Weight of Soan Papdi is 500 Gms.